China here we come: The Extreme Sailing Series™ gets ready for Act 2, Qingdao | News: "The fleet of eight, super-fast hydrofoiling GC32 catamarans will take their place on the water in Fushan Bay to commence battle from 29 April – 2 May. With only one Act under their belts on the new GC32s, many of the crews are still learning the ropes on the foiling flying machines. The crews, from 16 nations, are likely to face tricky wind conditions in Qingdao, making the already steep learning curve even steeper." Above: Check out some of the best video moments from a spectacular Extreme Sailing Series 2016 season opener in Muscat. Nine years ago the Extreme Sailing Series took high performance racing to the crowds and changed the sailing world. With the short courses and fast action, the series influenced some of the biggest events in sailing. Now in its 10th year the ESS ups the ante once more as the fleet takes to hydrofoils on brand new boats. 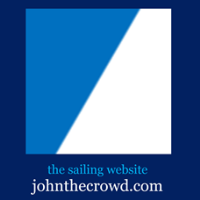 Published April 25, 2016 At the other end of the scale, 900 junior sailors race at one event on Lake Garda. Aside from the spectacle, you can’t help wondering how many of tomorrow’s stars are in there. So we asked some of the world’s top sailors about what the Optimist meant to them. Plus, how the newest boat in the Olympics is challenging the best sailors in the world and how one man’s work changed a generation of yacht design. Plus news from around the world. The 2016 Booby Island Regatta & Sailing Festival: "The Booby Island Regatta & Sailing Festival--30th April – 2nd May 2016--Anyone Can Enter. Anyone can Win The Booby Island Regatta and Sailing Festival is a fun 3 day Regatta and Sailing Festival in the beautiful Caribbean islands of St Kitts and Nevis. The Booby Island Regatta is a little bit different to the norm. We have designed the sailing to give everyone the opportunity to take part and compete regardless of the yacht’s capabilities or crew’s level of experience and have included a few of our own ideas to level the playing field. Our race philosophy, borrowed and adapted from the Olympics ethos, is “The most important thing is not winning but taking part; the essential thing in life is not conquering but living well.” Alongside three days of sailing we have a full program of events to encourage competitors and spectators alike to come ashore and enjoy the best that Nevis has to offer." The first full week of the Seattle Pacific Challenge presented a huge range of difficult conditions in this stage of the Clipper Round the World Yacht Race. Right from the start, the fleet engaged in close match racing in a hard fought battle from China, past South Korea and Japan, before heading out into the remote North Pacific. A combination of strong currents, pushing amateur crews against storm force winds, towards Seattle, on the US West Coast, churned up steep waves which battered the sturdy 70-foot ocean racing yachts. "I have probably sailed from Antigua to Bermuda 10 times; it is the classic delivery up from the Caribbean to the East Coast of the United States. In a normal boat it would be a five day trip, but Phaedo could possibly do it in two days. We literally passed Bermuda when we set the Antigua to Newport record last year and we did that in about 48 hours! Ideal conditions for us would be a well established high pressure system to the east of Bermuda, so we start with a 20 knot southeasterly, which becomes more southerly as we approach Bermuda - that would be perfect. Phaedo should be in Bermuda for a couple of days so if you want to come and see a real offshore, mile-eating machine, come along and have a look," says Phaedo3's British Co-Skipper, Brian Thompson. Fifteen yachts ranging from 43 to 139ft (13-42m) have already registered their interest for the inaugural 2017 Antigua Bermuda Race. Yachts from all over the United States, Great Britain, Bermuda and Antigua are amongst the early entries, which include Supermaxis, Maxi Racing yachts, Classics, Performance blue water cruiser and high performance multihulls. Joining the schooner America and 112ft (34m) sloop, Spirit of Bermuda will be two British Maxi yachts; Peter Harrison's 115ft (35m) ketch, Sojana and Mike Slade's Maxi 100, Leopard 3. Lloyd Thornburg's MOD70, Phaedo3 cannot wait to get into action and will be attempting a record run this year prior to the 2017 Antigua Bermuda Race. The 935 nautical mile race from Antigua to Bermuda will start on 12 May 2017 following the 50th edition of Antigua Sailing Week. Competing yachts will arrive in Bermuda for the Louis Vuitton America's Cup Qualifiers, the 35th America's Cup Match, America's Cup Superyacht Regatta, J Class Regatta and the Red Bull Youth America's Cup. Phaedo³ racing in the light winds during Les Voiles de St Barth. Phaedo³ at Les Voiles de St Barth 2016 from Ocean Images on Vimeo. United States Sailing Association | Rio 2016 U.S. Olympic Sailing Team Roster Announced: Listed in Order of Date of Selection: 49er (Men’s Two-Person High Performance Skiff): Thomas Barrows (St. Thomas, U.S.V.I.) and teammate Joe Morris (Annapolis, Md.) – For Barrows, this will be a second shot at the Olympic podium, having represented the U.S. Virgin Islands in the Laser class in 2008. Five-time U.S. National Champion and college sailing standout Morris will compete at his first career Olympics. 49erFX (Women’s Two-Person High Performance Skiff): Paris Henken (Coronado, Calif.) and Helena Scutt (Kirkland, Wash.) – Rio 2016 will be the first Olympic Games appearances for both Henken and Scutt, who won bronze at the Toronto 2015 Pan American Games. Nacra 17 (Mixed Two-Person Multihull): Bora Gulari (Detroit, Mich.) and Louisa Chafee (Warwick, R.I.) – Two-time Moth World Champion and 2009 US Sailing Rolex Yachtsman of the Year Gulari will team up with college All-American Chafee in the first Olympic Games appearances for both. Laser Radial (Women’s One-Person Dinghy): Paige Railey (Clearwater, Fla.) – Rio 2016 will be the second consecutive Olympics for Railey, a World Champion, Rolex World Sailor of the Year, three-time Pan American Games medalist and US Sailing Rolex Yachtswoman of the Year. Finn (Men’s One-Person Heavyweight Dinghy): Caleb Paine (San Diego, Calif.) – Paine, a Sailing World Cup Series Champion, has been the top-ranked American Finn sailor since 2012, and will compete in his first career Olympics. Laser (Men’s One-Person Dinghy): Charlie Buckingham (Newport Beach, Calif.) – The Laser North American Champion, Two-Time College Sailor of the Year and Toronto 2015 Pan American Games representative will sail at his first career Olympic Games. Women’s RS:X (Women’s Board): Marion Lepert (Belmont, Calif.) – Rio 2016 will be the first career Olympic Games for the Toronto 2015 Pan American Games bronze medalist, who also made the podium at the 2015 RS:X U21 European Championship and won the medal race at the top-level 2016 Trofeo Princesa Sofia regatta in Palma, Spain. Men’s RS:X (Men’s Board): Pedro Pascual (Miami, Fla.) – Pascual won the RS:ONE European Championship before making gold fleet at the 2016 RS:X Worlds, and will sail in his first career Olympics. Women’s 470 (Women’s Two-Person Dinghy): Annie Haeger (East Troy, Wisc.) and Briana Provancha (San Diego, Calif.) – Winners of the 2015 Olympic Test Event in Rio de Janeiro, Brazil, 2015 US Sailing Rolex Yachtswoman of the Year Haeger and Youth World Champion Provancha will make their first career Olympic Games appearances. Men’s 470 (Men’s Two-Person Dinghy): Stu McNay (Providence, R.I.) and Dave Hughes (Miami, Fla.) – McNay will compete at his third consecutive Olympic Games, but his first with teammate Hughes. The veteran pair have compiled an impressive list of podium finishes at many of the world’s toughest dinghy regattas since January 2013. All of the worlds best skiff sailors were in Barcelona, Spain for the last major regatta before the Rio Olympics. Les Voiles de Saint-Barth 2016, Wednesday, April, 13th. Other Sailing News: Ian Bruce Brought Sailboat Racing Back to the Basics: 1933-2016 - WSJ: "Industrial designer and Olympic sailor developed the Laser, one of the most successful sailboats ever ...."
Above: onboard Varuna VI - watch this amazing 360° video from yesterday's training! Published April 11, 2016. It's show time - Les Voiles de Saint Barth 2016 : Les Voiles de Saint Barth 2016: "Plenty of recognizable names -both in terms of boats and people – will attend, starting with the returning 100-foot speed machine Comanche and its celebrity owners Jim and Kristy Hinze-Clark and skipper Ken Read, who is at once one of the most celebrated sailors in the world and the 2016 event's “Godfather”, chosen by the organizers to oversee the spirit of the event. Then there's the mighty multihull Phaedo3 and its skipper Lloyd Thornburg, who has made it his mission to break any and all speed records he can…and he has. Add to that the new 100-foot technological wonder Galateia; an excellent gathering of three Volvo boats (Brunel, SFS and Ambersail, with Bouwe Bekking, Lionel Pean and Linas Ivanauskas in charge, respectively); two Maxi 72s (Dieter Schoen’s Momo and George Sakellaris’s Proteus); the 94′ Windfall(Tim Goodbody); 92-foot La Bête (Yves Montanari); and 82′ Highland Fling XI(Irvine Laidlaw) and you’ve got quite a spectacle percolating on the big-boat end of things...."
The High Seas Shouldn't Be Like the Wild West - Bloomberg View: "... The high seas -- any part of the ocean more than 200 miles from a coast and beyond national jurisdiction -- account for more than half the ocean's surface area and generate nearly half the global ocean's biological productivity. Yet they are only lightly governed by the 320 articles and nine annexes of the United Nations Convention on the Law of the Sea. Talks on updating the 1982 treaty, which was bolstered by a 1995 agreement on migratory fish stocks, opened last month. A lot has happened over the last few decades. The world's fisheries are under greater strain. As bigger fleets range further afield, more of their catch is coming from the high seas, threatening the ability of stocks to rejuvenate. More than 15 percent of the world's catch is already taken illegally, by rogue trawlers flying flags of convenience and using drift nets and other destructive methods..."
UPDATE Congressional Cup 2016, April 10, 2016: Long Beach Yacht Club, Sunday: Perfect conditions were on hand for the finals of this year's finals as four team vied for the crimson jacket. Long Beach 2016 | World Match Racing Tour: "The Congressional Cup is one of the most respected trophies in match racing history. In 1963, the goal of the Club’s Congressional Cup founders was to create an annual, world-scale regatta that would run over a short course with intense action, and offer a competition that would be a true test of skill by using equal and identical boats. The first regatta was held in 1965. Through the years, Congressional Cup has attracted an increasingly impressive following of internationally renowned skippers and crews – including many America’s Cup participants – have sought an invitation to the regatta. Now in its fifty-second year, Congressional Cup is back as the only monohull event on the World Match Racing Tour." MOD 70 Phaedo3 doing 35 knots during a World Record-breaking sail from Cowes to Dinard. Phaedo3 breaking another speed record. All footage shot by Phaedo3 Navigator Miles Seddon (from Bill Springer on Vimeo - September 2015). Clipper Race Fatality Statement (Official) re: Sarah Young April 1, 2016: We are deeply saddened to report the death of crew member Sarah Young (40), a company owner from London. Sarah was one of the crew aboard the IchorCoal boat (CV21). Next of kin have been informed and all our thoughts are now with Sarah’s family, teammates, and loved ones on and off the race. Skipper Darren Ladd reports that Sarah was tidying the cockpit after reefing the mainsail in 35 - 40 knots of wind, when she was knocked from her position by a wave. She fell back toward the guard wire and was swept under it by another wave at 1127 UTC (2227 local). She was not tethered onto the yacht at this time and was swept away in strong winds. Sarah was the owner of a personal lifestyle company providing services for private high net worth individuals. A keen adventurer, the Clipper Race had been an ambition of hers for some years, and she said celebrating her 40th birthday just before setting sail from London was the perfect way to start her adventure. Prior to the Clipper Race she had done other expeditions including spending a year in Sabah, northern Borneo, working for Raleigh Malaysia. Sarah had also led teams in Zambia, Botswana and Namibia, had been mountaineering in Nepal and did a world-first 18 day trek down the Skeleton Coast unsupported. Sarah had also run a marathon and was a Divemaster. She leaves a partner but no children. Manly Yacht Club Helly Hansen Women's Challenge 2016 - It was a day of extremes for the second half of the Helly Hansen Women’s Challenge on Sunday March 20. Large cloudbursts rolled down the harbour from the south every 15-20 minutes, leaving brief respites of unlikely sunshine and blue sky before the onset of the next downpour. In the cycles of rain and major changes in wind strength the crews of the yachts faced a whole spectrum of challenges on the day, ranging from deciding when to put a reef in, when to take one out and, most importantly, when to take off the wet weather gear and show off the carefully crafted fancy dress costumes! Dale Lorimer attempted to shelter her camera gear in the cloudbursts and shoot in the drier phases; here’s the action, the smiles and even some of the costumes that she shot. Oh, and look out for Little Nico’s show-stealing performance towards the end of the video!